Home > Poorboy's World EX-P Sealant 32 oz. Protection, durability and a beautiful finish wrapped into one! When you think “wax,” do you imagine hours of drudgery with a smelly, hard-to-manipulate paste that is a struggle to remove? No more! Forget all about that stereotype. The modern alternative (and a good one at that) to traditional waxes are synthetic paint sealants, formulated for people on the go: On easier, buff off easier, last two or three times as long, and withstand higher temperatures without compromising durability. They make caring for your car properly a breeze. Poorboy’s EX-P is revolutionary in the world of paint sealants. Typically, applying a paint sealant in direct sunlight is a BIG no-no. Well, EX-P shatters the rules on that one! Designed especially for use in high temperature climates on cars that sit in the hot, hot sun day after day: It’s virtually a paint sealer on steroids! Because it’s so easy to apply, smells, looks and feels like tropical sun block, and can be used in the sun, you may just find looking forward to wax day! Poorboy’s EXP goes a long way! Just one coat of this magical lotion is all you need to protect your car’s finish for three to six months…and, the look it achieves is nothing short of phenomenal! A gorgeous shimmer that gives you the feel of gazing into a deep pool of color. 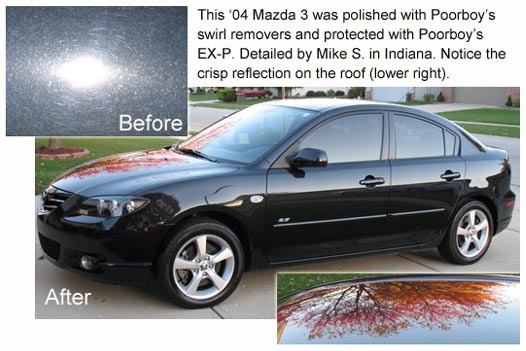 The guys at Poorboy’s set out to formulate a unique paint sealant when they made EX-P—one that yielded such fantastic results with minimum experience and effort, that even a first-timer would experience 100% success! Best of all, Poorboy’s EX-P is a steal! You’re sure to agree after you experience the results that EX-P delivers! Another Poorboys great value. Not the easiest to work with if put on too thick (which I have a habit of doing). Looks great and lasts a long time on my white truck.